Â First you have to section off the hair that will become the bangs. Sort out a triangular area, going about 1/2″ back from the hairline in the middle, and tapering to two points (on mine I used an imaginary line along the outside of her eyes). Bundle the section in a rubber band well below her face. Tease them so they are solid and even across her forehead. (If you pull them straight down, you will have a lump in the middle because the part is thick. Spread the hair from the part out to avoid the bulge!) I used a headband to hold them in place, a scrunchie would work too. Just use something cotton so it won’t be hurt by the iron! Also make sure that the rest of her hair is smooth and the part is perfect. Any hairs out of place will stay that way after step 3! Take off the towel and headband, but not the rubber band – make sure there are no gaps in the fringe! If it looks good, you can unplug your iron. If not, tease them as needed and repeat step 3. Â While the hair is a little damp from the steam, cut to the desired length with sharp scissors. Take small snips at a time and use a fine-toothed comb to control it. Cut it a little longer than you want the final product – they will shorten up about 1/8″ as they dry out.You can always take more off once they dry and settle into their natural position. For feathered bangs, follow steps 1-3 above, but cut the hair MUCH LONGER than you want the final bangs (about an extra half inch, or in the center of the eye-hole). Holding your scissors vertically (parallel to the strands of hair) begin taking small, quick snips off of the tips of the hair until you have achieved the desired length and shagginess. feathered bangs look great on B-hair with a slight curl (just about all of them except LM, AB, and Piccadilly have “curly” hair). Can you do the same for the petite Blythe? How do you get rid of the end frizzies? Mine is a Takara Petite and her back ends are frizzie. Pretty uneven too. shelley – you can steam-iron petites’ hair. I straightened a petite totally tartan and she looked great. As far as i know, it is the same fiber. might be safe to test first on a small section in the back. thanks. I don’t like how they cut her bangs. Very odd looking. I was trying to take her head apart to see if I could redo her hair. I could not get it all the way off. The top latch or whatever, would not come free. Do you know how to do it? I just did her hair. She has a bit of a curl…Just like mine. I feathered her bangs and that is what she needed to have ‘her’ look. Still no name, but working on it. She had mint green hair. Do you need to have the part in the middle for it to work? Or can it be anywhere? yann – I find it best if the part is in the center for straight-down bangs, however people have had good results with more of a side-swept-bangs look on sidepart girls. What doll do you have? oh my god that’s so scary! why would you iron your blythe! heat/boiling water is commonly used to style doll hair. Alternately, you could dip her bangs in a pot of boiling water. Sounds like you aren’t ready to customize your blythe, Christa. am i able to make it as striaght as the one in the thumbnails above by soaking in boiling water or ironing it? sandy – do you want all of the hair straight or just the bangs? with the girls that come pre-curly, you can get the hair very straight by ironing under a wet cloth, but the tips will probably keep their slight curl. I straightened my skate date’s hair but the tips always curl up. I don’t think I have ever felt the texture of prima dolly ginger’s hair, but it wouldn’t hurt to try it on your doll. just keep the cloth wet! yup i want all of the hair striaght. by the way what blythe is she? as in the one with black hair in the thumbnails? the blythe in these pictures is my Love Mission, Nyx!. oh did you reroot it? or you striaghtened it by ironing? i’m so totally in love with her hair! Can I straighten my Ashton Drake Dolls hair using an Iron? Is her hair different thant the Takara Blythes? I just received her on Thursday. I gave her some short wispy bangs and added the little side bits of longer hair into her bangs. What is the boiling water method? I don’t have a working iron at the moment. I have actually never flat ironed an ashton drake, so you should take a small cutting from the back of her scalp to test first. for the boiling method, basically you boil some water, then remove it from the burner and wait a few minutes after the bubbles stop, and then either pour it over your doll’s hair or dunk her head in and comb it while it’s still hot to smooth it out. I have a Saffy on the way but I’ll be wanting to change the colour of her hair. The cut is pretty much how I want it after a bit of tweaking but I saw somewhere that someone had bleached their dolls hair then re-dyed it. This would be ideal for me as I want it a very pale ash blonde (greyish) and I havent found a wig that is suitable. Do you have any information on what kind of bleach and/or dye is used and any tips? It would be most appreciated. This is my first blythe and I don’t want to scar her for life! Hi amy – as far as I know, it is not possible to bleach blythe’s stock hair. 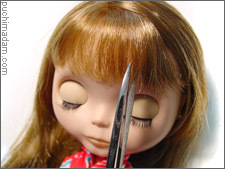 doll hair is synthetic – the color is embedded in the plastic strands. since saffy’s hair is a light blonde though, it wouldn’t be too hard to dye it just about any color. 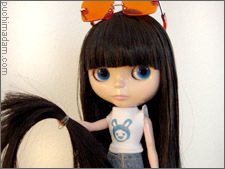 RIT is the preferred type of dye to use on blythe hair. have you ever thought about getting a Hollywood? she has almost the same cut as saffy and has silvery blonde hair. That’s what I thought about the bleaching but I thought I’d ask in case there was some miracle product available. I drool over every Hollywood I see as her hair is almost exactly as I want it (except a little straighter and in a graduated bob) and her skin tone is ideal as well but unfortunately my budget won’t stretch that far at the moment so I thought I’d get a Saffy and customise her (which actually I’m really looking forward to doing if a little terrified!). I have no doubts that I’ll love her anyway. My boyfriend and little boy are sick of hearing about her imminent arrival which they have named D-Day (D for Dolly!). Well thanks for you help, I’m sure this is not the last you’ll hear of me, no doubt I’ll be posting links to photo’s before long and bragging about my new best girl. Hi there! I have a question … did you/would you undo the thatching on the front part of the hair that is going into bangs? Also, I’ve seen your girls’ gorgeous hair on flickr … do you wash with something special? It looks incredible. 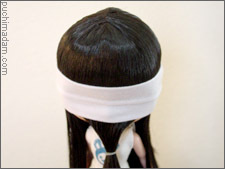 And how do you get the lovely slight curl on the bangs, like on your Aubrey (and Ebi, and your DD)? I covet that look! hi julia – I don’t intentionally pick apart the thatching, but sometimes when I am combing the front, a couple of lines just come out. it’s perfectly okay so long as it looks nice and smooth with no gaps before you iron it. for the slight curl, I used to roll up a washcloth into a little log and put it under their bangs, then cover with a wet towel and iron the curl in place, but I found a curling iron with an extremely low setting that doesn’t melt plastic, so now I use that. If you are going to experiment with heat tools on plastic hair, I strongly recommend testing on a small piece of hair in the back of the head, or scraps after cutting bangs. Emily – Yes, I do pullip bangs the same way. with you’re tutoral of cutting bangs my PD Ginger looks beautiful. she is my first costum and I even changed the eyecips,it was very easy thanks to you. Mind showing pics of your PDG after the hair cut? Would like to try on my PDG but doesn’t have the courage to haha. Hi Rachel – what Blythe do you have? gentle brushing should soften tight curls. Would it be alright to use the ironing method to straighten the rest of the hair, not just the bangs? And would it have to be wet? Elena – place a wet towel between a hot iron and blythe’s hair at all times. 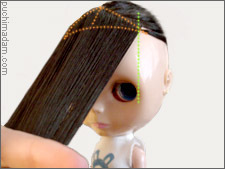 Yes, this method works for straightening all Blythe hair in general. I’m going to cut bangs tonight! My very first customization!!! So exciting. Great tutorial, but I have a quick question.. I just tried to give my LM side bangs using this technique, (w/o cutting them yet) and I did the ironing part, but the bangs did not stay to the side. Is it hard to do that because she has a center part?? Any tips on how to give my LM side swept bangs?? Jemmifire – I would re-press the bangs. 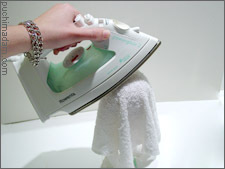 Make sure the iron is on the hot cotton setting and the towel is wet but not too thick. If the bangs don’t stay to the side, it may be because her hair is too heavy to support its own weight to when it’s swept to the side. I have never given my girls side-bangs so I’m not sure. You may have to keep a hairclip in them to keep them off her face. ok thanks I’ll try that! !, I also thought of another solution I’ve done with pullips, but I’m not sure if it’s possible to do with a blythe. 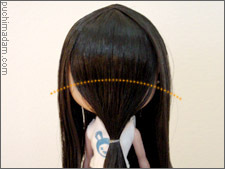 With a pullip wig, I just re-wigged with the part to the side if I wanted side bangs, would I be able to do that with the scalp.. (move it to the side?) Or does the scalp have to line up an exact way?? Jemmifire – twisting the scalp a little bit works if you don’t mind a little bit of a gap in the back (blythe scalps are not a perfect circle). You would have to glue it down (at least in the front), so moving the scalp frequrntly wouldn’t be very practical. Hi. I am ordering my very first Blythe, Ashton Drake Golden Goddess. The hair is very thick that the bangs buldge out. How do i make it thinner? Also, I have a hair straightener. Can i use it to straighten the doll’s hair? Thanks! I’m not an expert at ADG hair, but I do remember from my redhead years ago that it is a very different fiber from takaras. If you attempt heat tools, please test on a strand of hair from an inconspicuous area of her head. you can try to tame her bangs with a hot steam iron (over a wet towel), and then use some sort of cloth tube (a piece cut from a pair of pantyhose or socks works wonderfully) to hold her bangs down for a couple of days. I don’t think thinning the hair would do anything but give her unsightly flyaways. Thanks for all the wonderful tutorials! I’m about to get my first Blythe (she’s a Neo, Enchanted Petal!) and I am hoping to do a dramatic couture-type curly look on her. Do you use curlers with wet hair to get tight curls? I saw My Little Pony tutorial where the person put conditioner in the hair and used straws & elastic bands to get tiny curls. Would you recommend such a method for Blythe, or is low temp curling iron my best bet? If so, just how low temp does it have to be? Cyn – the best way to get tight curls is to curl the hair up (curlers, perm rods, or straws and bands) and then dunk in some gently boiling water (removed from the heat). Immediately put her in the freezer. let her dry thoroughly in front of a fan. when you pull her curlers out, rub some anti-frizz on your hands to keep the flyaways under control. Thanks Melissa! just one more question… How long should she go in the freezer for??? Cyn – oh, until her hair is kinda crispy with frost. wouldn’t hurt to freeze it solid, though. Hi! Thanks a million for all these tutorials, they’ve been such a help to me. I have two questions about this one though. Would it be a good idea to try to feather a doll’s factory bangs like mod molly’s or natasha moore’s? And also, I have a RRe that I would love to give feathered bangs too(yes, I’m quite the fan of feathered bangs), but would it be a good idea since her hair is so straight? Christy – I love feathered bangs! I think if you like that style, go for it. On girls with really straight hair, I like to curl the bangs a bit by Rolling up a small wet washcloth like a hotdog. Place the washcloth roll across her forehead, under the bangs. Lay a second wet towel over her bangs and press with an iron on the cotton setting. If you don’t like the curl, you can always press them flat again by removing the rolled cloth. I was wondering if its possible to do this on an Ashlette? I really want to give her bangs. Help please. I am just about to get a Fruit Punch in the mail and really want to give her bangs. She has a side part. Do I use the same method as above to do a side part? Because it is a side part I would think having the bangs totally straight wouldn’t good any suggestions?